Two Models available. The DP has the preamp sepparate from the pickup, which can be mounted on the tailpiece of the bass, or sepparate from the instrument. 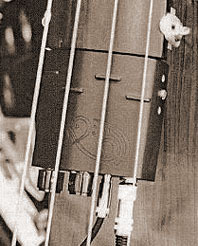 The ‘MT’ is a self-contained unit with both the coil and the preamp attached to the fingerboard. They have adjustments for each string so that one can even the output of the four strings. There is an onboard volume, pan, and tone. The mixer allows one to mix in a piezo transducer, and blend the two sounds.